The best way to describe Ant-Man and the Wasp is incredibly likable and fun. Taking place two years after the events of Captain America: Civil War, we find Scott Lang, aka Ant-Man, serving his final days of house arrest after secretly helping Captain American during a battle between the Avengers in Germany that violated the Sokovia Accord. Grappling with the consequences while also balancing his life as both superhero and father, Scott is approached by Hope van Dyne and her father Dr. Hank Pym to help create a tunnel to the Quantum Realm to save Hope’s mother, Janet, aka the original Wasp. While creating the tunnel, a new threat who calls herself Ghost emerges to foil our hero’s plans, steal the tunnel, and use it for her own vain. It’s up to Scott and Hope as they team up to stop Ghost and save the day as Ant-Man and the Wasp. While it doesn’t leave as big of a sting as Avengers: Infinity War did, Ant-Man and the Wasp is still a great film overall, and perhaps even on par with the first film in the Ant-Man series. The film’s strongest element definitely come from the characters themselves. They’re all funny, likable, and each actor does a great job moving the story along while making you emotionally invested in them. Paul Rudd as Scott Lang is so enjoyable to watch playing both the hero and a dad trying his best to make his young daughter Cassie, played by Abby Ryder Fortson, proud of him. Some of the best scenes in the film are when you see Scott and Cassie bonding, whether on a deep level or being silly and having fun as father and daughter. Evangeline Lilly as Hope also does a great job donning the Wasp suit and showcasing her powers and abilities. In turn, she shows a softer side of her character who is not only tough but understanding and a kind woman attempting to reunite her small broken family. And that’s another thing this movie does really well: emphasizing the theme of family, unity, and love. Michael Peña as Luis and Scott’s best friend steals the show whenever he’s on camera doing his thing and is honestly one the best supporting cast members in the Marvel Cinematic Universe. 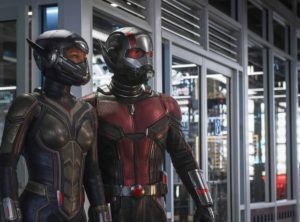 A solid and entertaining sequel, Ant-Man and the Wasp is a charismatic summer blockbuster that will have fans laughing and smiling from beginning to end. The film’s tone and humor are amusing and doesn’t feel forced like some of the other Marvel films have in the past. The costumes and effects are well done as the warm and bright colors provide a delightful tone to the movie. The villains were so-so but did offer for some entertaining scenes. Though I will give Hannah John-Kamen who plays Ava Starr aka Ghost this, her acting was superb and that costume was awesome. Also, you most definitely want to stay after the credits.